As I was preparing to board a plane home at Israel's Ben Gurion International Airport a few weeks ago, I followed the news reports that Chief of Staff Rahm Emanuel's son's bar mitzvah would be moved outside of Jerusalem for security concerns. 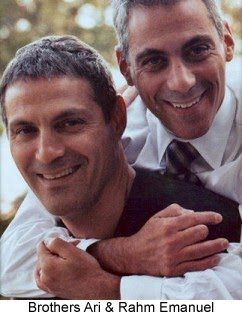 Rahm Emanuel and his Hollywood agent brother, Ari Emanuel, brought their families to Israel on vacation and for their respective son's Jewish rite of passage. Apparently, protesters were heckling the Emanuel family's delegation as they toured Jerusalem's Old City because of the Obama Administration's purported views on Middle East affairs. Ultimately, Zach Emanuel's bar mitzvah went ahead as planned at Robinson's Arch, the archaeological site along the remaining Southern Wall of the Temple at which Conservative and Reform rabbis are allowed to officiate at bar and bat mitzvahs. The two cousins had their b'nai mitzvah on a Sunday, perhaps to confuse paparazzi, and it was officiated by each family's rabbi --Rabbi Jack Moline, of Rahm Emanuel's synagogue (Congregation Agudas Achim in Alexandria, Virginia) and Rabbi Kenneth Chasen, of the Reform Leo Baeck Temple in Los Angeles where Ari Emanuel's family belongs. Having recently spent the early dawn hours of Shavuot at Robinson's Arch, known as the "Masorti Kotel" since the Masorti/Conservative Jews can pray there freely, I was thrilled to read the op-ed in the Jerusalem Post by Masorti Movement CEO Yizhar Hess about the Emanuel boys' b'nai mitzvah and the lack of religious pluralism in Israel, especially at the Western Wall (Kotel). The [Emanuel] family stood together, prayed together. There was no mehitza [separation between the sexes]. Some women donned a tallit [prayer shawl]. There was an abundance of Judaism, an abundance of Zionism and an abundance of love. It is sad that one cannot pray in the same way at the main Western Wall Plaza. For a decade now, the Masorti Movement has been facilitating prayers at the Masorti Kotel. This is a forced arrangement. The majority of the world’s Jews pray without a mehitza, but when they come to Jerusalem, to the most symbolic site for Jewish prayer, they are forbidden from praying together. The Kotel, whose holiness has enthused Jews from all over the world, has been transformed into a haredi synagogue. The Masorti Movement has never relinquished its right to pray at the Kotel, but has agreed, in compromise and with great pain, to hold its prayers at the [Davidson] archeological park. With all of Israel's international struggles right now, one would hope that it would strive to solve this matter of domestic disharmony. Here's hoping that when Rahm Emanuel returns to Jerusalem for his daughter's bat mitzvah, the family will be allowed to mark this rite of passage at any part of the Kotel they choose -- and be free from protesters and paparazzi. The quoted article says, "The majority of the world’s Jews pray without a mehitza." However, I would argue that the majority of Jews who pray thrice daily, do so in minyanim with mehitzot, as is halachically required (based on BT Succah 51a, and reaffirmed by halachic authorities in Tzitz Eliezer 7:8, M'haram Shick 79, Zichron Yehudah 1:62, Igrot Moshe 1:39 who holds that this requirement is Biblical based on Zechariah 12:12-14, as well as Rabbi Joseph B. Soloveitchik and others). Perhaps, more synagogue-affiliated Jews belong to institutions that do not have mehitzot, however, those praying thrice daily with a minyan are most likely to be found in Orthodox shuls. Why should they, who take the requirement of prayer seriously, and who mention the importance of the Beit Hamikdash and the hope for its rebuilding (speedily and in our days! ), have to compromise a halachic requirement, unanimously agreed upon by all major poskim?